From Ibiza ferry port you can get a ferry to the ports of Barcelona, Palma, Valencia, Denia, Formentera and Alicante. These ferries are operated by Acciona Trasmediterranea, Balearia and Trasmapi. With the timetable below, it is possible to see the latest departure times, alongside a list of our best prices on ferries to Ibiza. Acciona Trasmediterranea's modern air conditioned ships are designed so that passengers feel their journey is a part of their holiday. On board their ships, in addition to a range of cabins and seating, you will find swimming pools in the summer months, bars, restaurants, cinemas and even discos. Trasmapi has a fleet of five fast catamarans that are all equipped to the highest possible standards. Their air-conditioned passenger only vessels normally feauture self service drinks and snacks or a bar and all but one ferry features out-door seating - meaning you can work on your tan even on board! Aquabus vessels are small and nimble, allowing them to sail close to shore. This gives passengers superb views of the Ibiza and Formentera coastlines from the top deck, where there is ample seating. Whichever route or company you choose for your Ibiza ferry, you are bound to have a pleasant and relaxing journey with either of three well known ferry companies. The sobriety of the cathedral, the Renaissance city walls, and the labyrinth of small streets that surround it, contrast with the cheerful and cosmopolitan atmosphere of the port, especially during summer nights, and have rightly contributed to the fame of the island. One of the main appeals for the visitors of the island is its 18 kilometers of beaches and creeks, from the most developed to the most virgin. 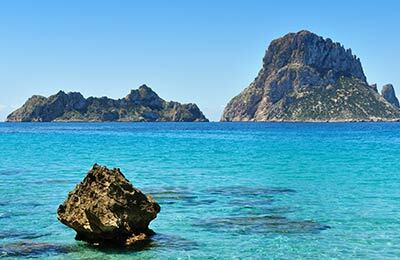 Ibiza is a very popular tourist destination, especially due to its legendary nightlife. 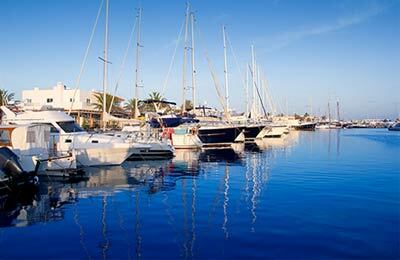 Ibiza Ferry Port offers a full range of services and facilities. Ibiza port is situated in Ibiza town. The access to the port is off Avenida Santa Eulalia and the passenger terminal is called 'Estacion Maritima del Puerto'.